I have only just joined Skadi and have been led in your direction by chance and I am very pleased to see such good order in a world of mayhem. In my case since early childhood I always had a Soul Deep Love for the German language and German culture in all its varied beauty and nature. Even the sight of beautiful Germanic 'Fachwerk' half timbered houses set off inner feelings of a yearning to be home. As a little boy watching the standard garbage war movies out of the hollywood propaganda studios I would be absolutely horrified at seeing German forces losing in any battle and equally in disbelief at them being portrayed in behaviour of thuggery which is the usual portrayal of 'hollywood insisted propaganda!!!! When I first returned to Germany as a teenager man in this life I was in a state of very high emotion eventhough as I crossed the border from the Netherlands I was not then yet fully aware of just how much of the country had been savaged away, the entire east of Germania raped and pillaged beyond comprehension by the ruthless cruel victors of WW2. Like most people growing up in a western nation I was indoctrinated at school by the carefully prepared ww2 allies propaganda which often had me in trouble during history class for back answering the teachers as my questions of often disbelief were considered troublesome.. I just knew inside this does not make any sense at all..how can it be and it often left me feeling very depressed..
My knowledge of the speaking language of German returned within six months and I ended up staying there in what was called 'West' Germany for up to four years. These remain four of the best years of this life. Strange as it turned out returning to Germany in this life crossing from Holland and then years later via a Past Life Regression flashback it was Holland where I was actually killed in combat in September 1944 aged just 21. The PL flashback was so Real it was a life changing experience in changing my perception on life entirely. When I awoke I was covered in sweat and shaking terribly and had a terrible thirst.. I thought I had actually copped it as I had been experiencing the last five minutes of that previous lifetime and it was absolutely vicious combat with no mercy spared by either side as US Airborne stormed our building and we were heavily outnumbered..
For anyone whom wants to laugh at this by all means enjoy your laugh as I am not here to try and convince anyone that reincarnation is a fact of life and death itself. That the Soul leaves one body and when the time is chosen can choose to be reborn in another body. I only wish to share my experience with you and perhaps may find others whom have similar experiences and find that inside there remains with them an everlasting desire to remain true to Germania and to fight for the truth about those terrible war years and stop the disgusting Lies that have followed via the victors propaganda in film and texts and whatever else they conjure up. Thanks to the open internet the Truth has broken out and has enabled like minded Souls to find each other across the realms of the madness of planet earth.. If anyone else has any similar experiences please dont be shy or fear ridicule.. I have some regression links if anyone is interested to watch a professional regression on youtube in 3 parts and is very fascinating to say the least. Well !! I have rambled on a little much for a first post so shall sign off for now. Please feel free to share your thoughts and especially your experiences regarding this subject matter.. The regression I made go further back into medieval times and one goes back to WWI also deadly combat. The connection to the third Reich comes more through the early stories of my father and my uncles who told a very different story of what I learned in school. (My first awakening was in Bergen-Belsen as I saw the swimming pool there and asked my father what that meant. He didn't have an answer but was puzzled as well). Sometimes I feel my (un)dead grandfather around who was quite involved (freikorps Rossbach, early Partymember, RAD and other things I better don't tell) wanting me to do certain things. On his behalf I did some undoing of a familykarma. The pictures I see when I do those thing have a certain power and influence too but my aim is to get free of those and be able to decide what is right uninfluenced by anything. It might also be that you had a relative experiencing the things you see and through the sudden death he didn't know he is dead and looking for another 'body' to cohabit. It is up to you to find that out and how you want to deal with it. I sent them to the north into the realm of Odin where their home is supposed to be. Unfortunately christianity destroyed the culture how to deal with that and I started to look into other cultures to learn about it and connect it to the bits of pieces which are left in literature, customs etc. It appears that Untersberger and I share a similar experience directly resulting from having been reborn after death in the body of a German during the Hitler period. I was born in 1944. I remember as a child seeing many war films presented as propaganda by BBC TV: I realized what propaganda was and knew that this was propaganda, so I ignored the commentary and had eyes only for the German forces. All the rest were Enemy. As a small boy I found the structure and flow of the German language easy to imitate, and though it was merely a copy and had no meaning, from hearing it my mother thought I had begun to master the language from hearing Hitler speak, so accurate was the likeness. By age 13 in this present life in England I had taught myself German and won the school prize for modern languages. I was the leading German-language scholar while rooted in the lowest stream at grammar school. My parents now considered I had a "kink" and that "my cabling " must have been incorrectly wired before birth. My mother even recalled that following my birth the delivery nurse brought me to her with the observation, "Oh mother, look what Uncle Hermann dropped down by parachute for you this morning!" which made all the staff laugh. The whole family, including the aunts, wondered if there was some mental treatment I should undergo to "set me straight". It was a well known fact amongst schoolmasters and classmates that there was "something wrong with me" in this respect but they made allowances because I was so good at sports. Today I have heartfelt loyalty for the Germany of the Third Reich, and remain true to the oath of allegiance to Adolf Hitler I swore in my past life. My father fought as a British serviceman in the Ardennes, and my mother survived the Blitz in London, and I can see that to have a son like me must have caused them much heartache. On the other hand, as I saw it, they had been and still were enemies of Germany, and by inference my own enemies of my former life, and the reader can see the perplexity and dilemma which such a situation causes. My first visit to Western Germany was in 1962 (Cologne) at age 18. I am very sensitive to an atmosphere and was shocked at the vibrations I felt there. At that time the defeat and all that went with it seventeen years earlier must have still been very fresh in the minds of those who experienced it first hand. (On my last visit (Frankfurt, 1998) the atmosphere had changed completely). In the early 1990s I was offered the opportunity to translate war books from the German for several publishing houses, and from these I have obtained a world view which has helped me see the situation far more clearly. In particular I have made contacts in Germany and Argentina regarding developments by the Reich-in-Exile postwar which lead me to believe that the miracle technologies of 1945 are in place and will be used successfully and finally within the next quarter century. I have had two paranormal experiences resulting from asking myself a question and concentrating on it. The second experience occurred in 2010 and was not connected to the reincarnation issue. In the first case, so certain was I of having been reincarnated from a member of the German forces that in 1972 I tried various hypnotists in the hope of obtaining past-life regression. Those consulted were unable to help me but one did assure me that the answer would come to me in a dream. That same year I did have a dream which I now believe supplied the identity of the person I was. It provided a location, Dresden, an activity, a symbolic word and a uniform. I was unable to identify the uniform and after a search abandoned the dream as a fantasy. A month or so ago while watching a bio-documentary on Europa-Europa cable TV to my surprise I saw exactly the uniform I had seen in my dream, and of course now I knew the branch of service in Hitler's Germany it represented. I then recalled the symbolic word in the dream, and interpreting this I searched the records of the organisation for the names of those who died in harness or in action before May 1943, the month of my conception in this life. The surname I now expected to find was there: he fell for Germany in February 1942, two years before my birth in this life. Of course, all this is merely a preliminary stage of the investigation, and the discovery occurred so late in my life that anybody who knew him is now probably dead. I have traced a family by this rare name in Dresden and on the occasion of taking my 16-year old daughter to Austria this coming December she has agreed we can make a detour to Dresden to make enquiries. In conclusion I would assure readers that the feeling that one has been transplanted from a Hitler-period body to an English body or whatever is overwhelming: it is always with you, it is difficult to allow an insult to Hitler's Germany to pass without speaking out, often the cause of difficulties. How happy the day when one finds a soulmate who also claims he was there, and you know from the way he acts and reacts that he really believes it of himself. (The feeling must be similar to that overwhelming conviction experienced by the trans-sexual born a male but who is convinced an error has been made and he should be female). In my case, and probably that of Untersberger, for us there is nothing to be learned from being reincarnated in modern Germany and for various reasons we cannot be reincarnated into the Reich-in-Exile: the important thing is that spiritually we progress, and use the information we obtained from that former life and this one to enhance our status and so move onwards towards that final goal, a goal not particularly racist in the modern sense of the word, that goal which Adolf Hitler set out for us all in the 1939 book by Hermann Rauschning, Adolf Hitler Speaks. Ive had a very vivid flashback episode where I had control of a huge gun turret inside a carved out cave on the side of a hill on a coast somewhere. I remember it being sunny and warm, a beautiful day, and there were naval ships on the ocean and lots of battle going on. The window of the bunker cave was rectangular. It had been carved out and inside was my gun turret. The bunker had a low ceiling. It also was tucked in to a corner in the hill. So you could see part of the ocean but I didnt have a panoramic view because it was blocked by part of the hill that was jutting out to the side of the bunker. And the gun was huge. It had a huge backfire. You needed a ton of strength to fire it and handle the backfire on it. "The order of castes, the supreme, the dominant law, is merely the sanction of a natural order, a natural lawfulness of the first rank, over which no arbitrariness, no “modern idea” has any power." This sounds as though it could be one of the big 8-inch bunkered guns on the east side of the Cotentin Peninsula, possibly one of the three at Marcouf, covering sectors of what the Americans were please to call Utah Beach. This was very high-class precise artillery with excellent gunners, commander Oblt. Ohmsen received the Knights Cross. The weather is right, huge naval force is right. Those guns were under perpetual naval bombardment and suffered heavy casualties 6-8 June 1944, but managed to sink two US destroyers, USS Corry and USS Rich. 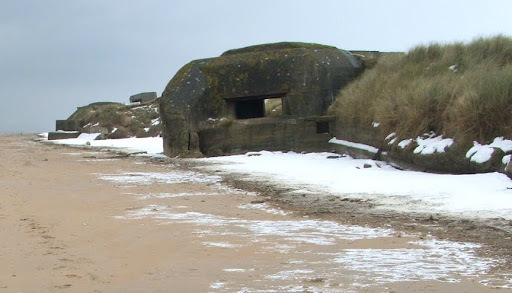 Im sure it wasnt the The Saint-Marcouf Battery after looking at photos because neither the gun or the bunker was that big. It was also a lot closer to the beach. It wasnt kilometers off the beach like that. It was definitely set higher up on the cliffs. It seemed a lot like Pointe du Hoc. There was little beach and the action was more off to the right. I would have been to the Point's left. Please feel free to share your thoughts and especially your experiences regarding this subject matter.. Welcome! This is a late welcome, but better later than never... Very interesting and coherent post, thank you for sharing your thoughts and experience about the matter with us... I really appreciate it! In my case since early childhood I always had a Soul Deep Love for the German language and German culture in all its varied beauty and nature. Well, in my case the fact is that I have German/Germanic ancestry and I am both genetically and culturally closer to that part of my ancestry. And yes, I also had a fascination about the Third Reich since I've firstly heard about it, but I don't know if it should be about previous lifetimes or not. For sure it's about the blood that goes through my veins anyway, since I have German blood too. When I first returned to Germany as a teenager man in this life I was in a state of very high emotion (...) My knowledge of the speaking language of German returned within six months and I ended up staying there in what was called 'West' Germany for up to four years. These remain four of the best years of this life. I only wish to share my experience with you and perhaps may find others whom have similar experiences and find that inside there remains with them an everlasting desire to remain true to Germania and to fight for the truth about those terrible war years and stop the disgusting Lies that have followed via the victors propaganda in film and texts and whatever else they conjure up. Thanks to the open internet the Truth has broken out and has enabled like minded Souls to find each other across the realms of the madness of planet earth.. If anyone else has any similar experiences please dont be shy or fear ridicule..
As I said in a previous post, I have a feeling that some of us here have met before... Also, it was recently that I met some like minded people for the first time in this lifetime, and I really had the feeling I knew each of them from before! I'm sure I haven't met them before in THIS lifetime, so it has to be about a previous one. In this way I was sure I was in the right place with the right people. Yes, I also think we are in this lifetime to continue some things from previous lifetimes. Especially when we remember certain things, as you do, or have a special feeling about them, then that's for sure the case! I have some regression links if anyone is interested to watch a professional regression on youtube in 3 parts and is very fascinating to say the least. Reincarnation is real. And people need to get used to it, and that they have past lives which explain a lot of what they are going through in this life.